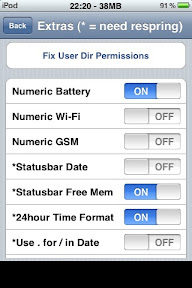 After buying my iPod Touch and playing a little with it, I realised that battery life was a problem, with the WiFi always on. Thus, I was always bringing up Settins-WiFi and turning on and off. There was no easy and quick way to do it... Until I jailbroke it. I installed SBSettings, and its first use was that. Swipe the upper status bar, and the menu shown above appears. One tap and I can kill the WiFi, turn on or off ssh acces, keep the WiFi up when the Touch is sleeping, and more. 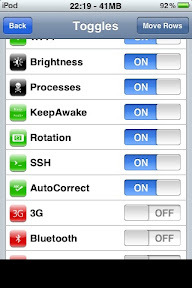 There are several available switches, and a few more (like the rotation inhibitor can be downloaded from Cydia. 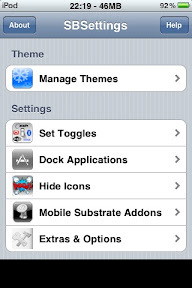 You can also set up direct access for some applications, with the 'Dock' menu. And in 'Extras & Options', youcan set numeric battery level and available memory (to know when it is safe to turn on "Backgrounding". All in all, a very nice utility for Touch and iPhone users.